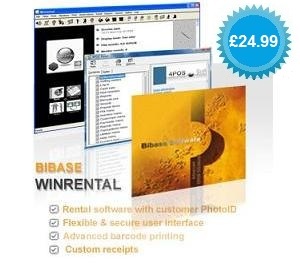 DVD rental software for Windows that provides all the features you need to run an entire rental store. It has databases for rental inventory and customers and tracks all current and late items. No additional hardware is required but there are facilities for receipt printers, barcode readers and till drawers. For security each transaction is individually allocated to staff with log on. Print facilities include membership forms, Photo ID cards and barcode printing. Reports offer daily summaries, overdue and multicopy analysis. . The trial download is a compact Microsoft installer file (MSI) about 1MB. It does not require registration or install any advertising components such as toolbars. Requires Windows XP or later. It has been specifically designed for ease of use (mostly one click operations). It is straightforward for your staff and you have a business overview at a glance. Each member can have a picture stored which dramatically reduces theft. The program will print membership cards with both photo ID and barcode. Each may be configured to work with your hardware. A custom receipt and byline may be designed. Several formats are built in ready to use. A wide variety of takings, category, overdue and multiple copy reports are available. The F12 key pulls up an overview of the most useful information. The program supports wedge and USB type barcode readers and will print both most commonly used Code 39 and EAN (UPC-A) barcodes on a variety of labels. A variety of special offers are supported from blanket pricing and day returns to configurable overrides. A closed day option is also available. A comprehensive sundry inventory section is available to look after additional retail sales. £24.99 Includes CD and shipping. £29.99 Includes manual, media and shipping. What is the difference between Winrental and 4POSRENTAL? Winrental is our entry level program. The 4POSRENTAL has a Unicode compliant database engine to facilitate international use and expanded customer and inventory information. It also has several additional reports on overdue and late payments and permits customers to rent up to 100 items.